Seishun Gakuen 3rd Year Class 2 Birthday: 30th April (Taurus) Height: 175cm Weight: 55kg Blood Type: O Dominant Hand: Right Play Style: Counter-puncher Shoes: NIKE(NIKE READY AIR ZOOM STERLING) Racket: WIMBLEDON(Tour Merit) Special Move: Moon Volley Favourite Food: Shish Kebabs, Clam Soup, Pears Hobby: Keeping Fishes, Swimming Family: Father, Mother, Younger sister Father's occupation: Tax officer Favourite Subject: English Favourite Colour: White Preferred type: Girls who look good with glasses Oishi is the vice-captain of Seigaku Tennis team. 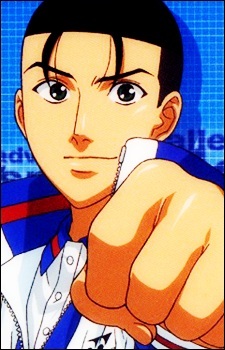 He is a worry-wart and is much concerned with other people's welfare, thus erning the nickname "Seigaku's mom". He plays doubles with Eiji Kikumaru and their tandem is called the Golden Pair.